The Energy Sentry 9360 Time & Temperature controller is a specialized utility load management device designed to control deferrable loads such as pumps for center pivot sprinklers and oil well pumping stations based on time-of-day and outside temperature. The premise of such a load management system is based on statistical data where a utility knows its peak system demand occurs on predictable days, during predictable hours and above a certain (usually predictable) outdoor air temperature. Money is saved with a 9360 by programming the unit to manage loads during on-peak days and/or for certain outside air temperatures. Thus, when either the set time period, temperature, or both are reached, loads are deferred reducing the amount of electricity used during high cost on-peak intervals. One of the ideal features of the 9360 is that it operates autonomously. Therefore, no wire line, cellular, satellite, radio, or other ties to a central system are needed. 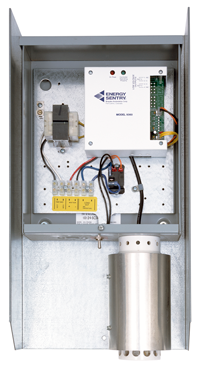 This is an ideal solution for remote areas where common types of control are not available or cost effective. 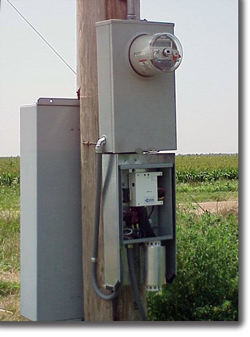 Loads normally controlled with the 9360 are pumps on center-pivot sprinkler systems and oil well pump jacks. Other loads may be controlled, especially any large load that can be deferred for a short period of time without any operational impact. The key to fully utilizing the 9360 is working with a rate that focuses on both time-of-use and temperature control. Input Power: 85-130 VAC @ 110 mA max, requires 15 Amp single pole breaker or other suitable disconnect. Midwest Energy Installed 30 9360's in early 2000 and tested them between June 1st and August 31st. The results were excellent! Subsequently, Midwest ordered an additional 350 units for installation in the Spring of 2001. Bob Bieker of Midwest Energy reports seeing 5MW reductions in July 2001 on Midwest's system when the 9360 controllers go on-peak. This reduction allows Midwest to purchase power economically and better manage their system. It also allows their end user customers to save on irrigation costs. Since then another 400 units have been deployed.